Students led by union leader Swati Negi forcibly closed DAV PG College over the non-issuance of admit cards to students belonging to the Scheduled Castes (SC) and Scheduled Tribes (ST) for the annual examinations scheduled to begin on March 25. As part of the World Water Day, the Uttarakhand Council of Science and Technology (UCOST) organised a water audit training workshop at Swami Ram Hospital University in Dehradun today. 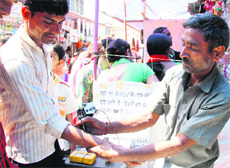 A number of small kiosks and tattoo making shops have mushroomed at the Jhanda Mela. These shops have attracting visitors who run the risk of contacting HIV through infected tattooing machines. Former Uttar Pradesh and Uttarakhand Chief Minister ND Tewari, on a ten-day visit to his native Nainital parliamentary seat with son Rohit Shekhar, today said he was touring the area to ascertain public opinion about his son fighting the forthcoming Lok Sabha elections. The Uttarakhand Kranti Dal (Panwar) has opposed voting rights to Tibetans settled in Dehradun. 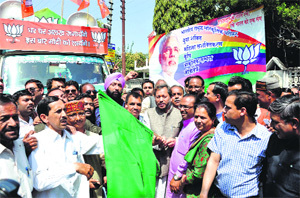 Uttarakhand BJP president Teerath Singh Rawat today flagged off a Modi Rath in Dehradun as part of the party's campaign for the Lok Sabha elections. Despite the Samajwadi Party (SP) being the lone party which had declared three months ago its candidate Nawaz Azmal Khan from Haridwar parliamentary constituency, it is now in a dilemma to select another candidate, owing to serious medical condition of its declared candidate. The Aam Aadmi Party (AAP) is banking on the clean and honest image of its candidate from the Haridwar constituency to garner votes for the Lok Sabha elections. The Almora parliamentary seat, which has been the stronghold of the Congress since the first Lok Sabha elections in 1952, has won 10 times from here in the 16 parliamentary elections. Pradeep Tamta won the seat for the Congress last time in the 2009 parliamentary elections. Gearing up for the forthcoming board examinations of the State Education Board, slated to begin from March 27, a meeting of the principals, teachers and authorities of the district education office was organised here yesterday. 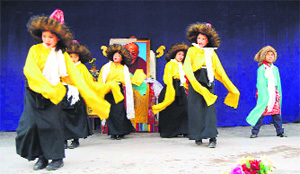 The graduation ceremony of class XII students of Central School of Tibetans (CST) was celebrated here yesterday. 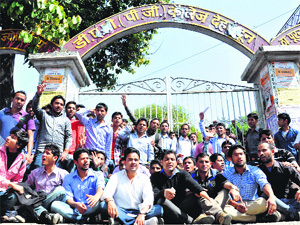 The protesting students demanded that the exam admit cards be issued immediately to 550 BA, BCom and BSc (first year) students belonging to the SC and ST categories. "The college management is playing with the future of a large number of students by not issuing them admit cards. The university must take suo motu cognisance of the issue and direct the college authorities to issue admit cards to the students," said Swati Negi. However, the college authorities said the examination forms of the affected students were not sent to HNB Garhwal University in Srinagar as they had failed to provide the mandatory family income certificates. Devendra Bhasin, Principal of DAV PG College, said there were around 6,000 SC and ST students studying in the college and the admit cards had not been issued to around 550 students who had failed to provide the mandatory documents. "We are scrutinising the documents once again and if we find that the admit card has not been issued to any eligible student, we will rectify our mistake and issue the admit card before the examinations," he said. While acting on a complaint filed by the students, the Uttarakhand SC/ST Commission has issued a notice to the principal of the college in the matter and directed him to resolve it at the earliest and issue admit cards to the aggrieved students. The Tribune has learnt that the admit cards were not issued to those students whose documents during the scrutiny of the admission forms were found to be incomplete and despite repeated requests they failed to submit their family income certificates. Vijay Kumar Dhoundiyal, Uttarakhand Additional Secretary Science and Technology, inaugurated the workshop. He said while Himalayas were considered water towers of the world, villages in the Himalayan region were facing acute water scarcity. He said it was important that the youth come forward towards the cause of water conservation. Dr Vijendra Chauhan, Vice-Chancellor of Himalayan Institute Hospital Trust (HIHT) said the water crisis was turning from bad to worse across the globe. H Kumar, Chief Engineer of the Central Water Commission said availability of water was limited and an intelligent usage was very important. He said by 2050, thirty five per cent of the population would be affected due to water shortage. Dr DP Uniyal, a senior scientist at the UCOST, Dr RP Singh and Dr Manju Sundriyal also addressed the gathering. Prashant Singh, coordinator, UCOST, coordinated the workshop. The day was also celebrated with fervour at Parmarth Ashram in Rishkesh, today. The event was organised by Parmarth Niketan Ashram in association with the Global Interfaith (WASH) Alliance and Ganga action parivar, where a special water blessing ceremony was performed. A procession was also held in which women took the lead, carrying decorative pots of water atop their heads as they travelled all along the banks of Ganga and the water was offered to the river amid chanting of Vedic mantras. Ramesh Kumar, a tattooer, said they change the needle of the tattoo machine after using it on at least 80 to 100 customers. “The life of a needle is limited to a maximum of 100 customers. However, before using it on a new customer, we wipe it with a cloth or wash it with water at the insistence of the customer,” he said. “A new needle costs between Rs 100 and Rs 150. We charge Rs 50 to Rs 70 from a customer for a tattoo. We won’t earn profit if we change the needle for every customer. Also, it is not possible for us to sterilise the needles as we keep moving from one place to another,” he added. According to experts, a used needle could become a carrier of virus of various diseases like AIDS, hepatitis and tetanus, putting the life of a person in danger. “A blood-soaked needle is a major carrier of HIV. Though the survival time of the virus is less, if blood on the needle of the tattooing machine comes in contact with another person, he can get infected with a disease,” said Dr DP Joshi. District Magistrate BVRC Purushottam said he was not aware about the risks associated with unprotected tattooing. “We have not received any complaint so far. However, a team comprising the Chief Medical Officer will be sent to the mela to conduct a check on the tattooers,” he added. “It is the people of the Nainital constituency who have to decide who should contest the election from the seat. 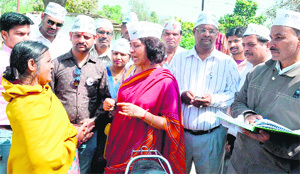 I will be able to say anything after knowing the public view,” Tewari told mediapersons at Haldwani. Tewari said, he wanted to do something more for the progress of the region if either he or his son Rohit was given the Congress ticket from the seat. “ I want to promote Rohit Shekhar from the seat as he is well qualified youth as had done law from Delhi University,” said the veteran leader. Tewari also expressed his concern for the last year’s disaster victims and said every one should come forward to help them. “The capacity to generate electricity from water resources is the assest of the Himalayas which should be fully exploited to make people of the region richer,” said Tewari. Asked on the effect of the Modi wave in the country, Tewari said the people who think they had learnt much in politics, sometimes prove to be immature. Rohit Shekhar, son of the veteran leader, told mediapersons that he wanted ND Tewari be given the party ticket from the seat as he had been an eminent freedom fighter and had served the people of this region.“ If the people of this parliamentary seat agrees to the suggestion of my father to field me as a candidate from the seat, I will contest with his blessings, ” said Rohit. UKD (Panwar) president Trivendra Singh Panwar told mediapersons in Dehradun today that their party opposed voting rights to Tibetans settled in Dehradun. He said, according to the Constitution, the Tibetans were refugees and thus could not be granted voting rights. Another UKD (P) leader Latafat Hussain said besides Tibetans, the party would also oppose voting rights to Bangladesh natives settled in the state. Panwar said while the UKD had fielded Rakesh Nath from Haridwar, Vijay Pal had been given the ticket from the Nainital parliamentary seat. He added the party would shortly announce its candidates for the other three seats of the state. Panwar said the UKD would contest the Lok Sabha elections alone and would not have an alliance with any party. Asked about AP Juyal’s expulsion from the party, Panwar said the former wanted to bring back those leaders into the party who had been constantly trying to weaken it. Juyal was the working president of the UKD. Rawat told the gathering that there was a clear Narendra Modi wave in the country. He said the people of Uttarakhand were very excited and wanted to see Modi as Prime Minister. The BJP chief said the Modi Rath would move across the state and inform the people about the misdeeds of the Congress-led UPA government at the Centre. Uttarakhand BJP general secretary (Organisation) Sanjay, Prakash Suman Dhyani and Subhash Barthwal were present on the occasion. Azmal Khan was injured in an accidental bullet firing on February 26 at his home in Aithal, Pathri village. He sustained injury near his eye, and party sources term his condition serious. With election nomination date nearing, SP senior leaders and district office- bearers are now forced to opt for another candidate, owing to slow recovery of injured Azmal. As per senior party leader Dr Rajendra Parashar, the option of fielding Azmal Khan’s son Adnan Khan from Haridwar was being discussed. Parashar said as Azmal Khan is son of former Azad Hind Fauj General Shah Nawaz Khan, the family had a good image and respect among the public and with Muslim voters having a major say it would be better to field Adnan from the constituency. Former party state president Vinod Barthwal said any decision in this regard would be taken by the party high command, hoping that Azmal Khan recovers soon. Barthwal added that the SP was in a good position and could replicate its success of the 14th Lok Sabha elections when its candidate won from Haridwar. Party workers said the SP should declare the name of the alternative candidate soon as the BJP, the BSP and the UKD had already named their candidates and as the constituency was one of the biggest in the state, election campaigning will not be so easy for a new candidate. The AAP has fielded former Director General of Uttarakhand Police Kanchan Roy Bhattacharya from Haridwar parliamentary seat, pitching her against veteran BJP candidate Ramesh Pokhriyal Nishank. The party in its initial phase of campaign is laying stress on the clean, honest and down to earth image of former Bhattacharya. District unit member JP Badoni said that AAP had given a new dimension to national politics, with people hailing from varied segments being given the ticket, which was not the norm in other political parties. Badoni added that honest and blotless career of Kanchan Roy Bhattacharya stands apart, when compared to other candidates, be it in Haridwar, Uttarakhand or any other part of the country. “Voters are getting impressed by the stature and calibre of Bhattacharya. We are seeking vote on AAP’s credentials as well as of Bhattacharya. If candidate like her emerges victorious, then it will be an altogether different scenario. Bhattacharya is a woman with a mission in politics,'' said Badoni, while campaigning in the Kankhal area of the city. Women's wing activist Prerna Purohit added that being a woman, most of the female voters are getting impressed with Bhattacharya’s achievements and nature. Purohit said that clean ,honest, hard working, dedicated and reformist image of Bhattacharya is like that of Kiran Bedi. Party activists are also relating Bhattacharya as local as she has a paternal home in Lal Taura bridge area, adjacent to Ganga ghat in Haridwar. AAP election campaign coordinator Ajay Sharma stated that after focusing in city segments, the next phase will be in the rural areas of Assembly segments of Haridwar rural, Bhagwanpur, Lakshar and Jwalapur. The Congress won this seat for the first time in the first parliamentary election in 1952 when its leader and eminent freedom fighter Devi Dutt Pant defeated Praja Socialist Party (PSP) leader Purnanand Upadhayay by over 30,000 votes. Pant obtained 54,964 votes while Upadhayay secured 24,169 votes in the election. “The voting percentage, which has not crossed 50 per cent yet, had remained less than 30 per cent up to the 1971 parliamentary elections,” said Deep Joshi, a political science teacher based in Almora. After Devi Dutt Pant, Congress candidates Badri Datt Pandey, Jung Bahadur Singh Bisht, Narendra Singh Bisht, Harish Rawat and Pradeep Tamta won this seat in 1957, 1962, 1967, 1971, 1980, 1984, 1989 and 2009, respectively. The seat was reserved for the Scheduled Castes (SC) in 2009 when Pradeep Tamta won from here. The Congress lost the seat for the first time in 1977 when Janata Party candidate Murli Manohar Joshi defeated party candidate Narendra Singh Bisht. “Following the defeat in the parliamentary elections in 1977 the Congress continuously lost this seat in 1991, 1996, 1998, 1999 and 2004 when BJP candidate Jeewan Sharma (1991) and Bacchi Singh Rawat thereafter defeated the Congress candidates,” said Deep Joshi. The seat was reserved for the Scheduled Castes in 2009 and the Congress candidate Pradeep Tamta won the election. The opposition has also been changing in this constituency since the first parliamentary election. While the PSP was the main opposition party in the first two general elections (1952, 1957) in this seat, thereafter till 1977 the Bharatiya Jan Sangh replaced it when Janata party candidate Murli Manohar Joshi defeated Congress candidate Narendra Singh Bisht. “The upside of the BJP started from the 1991 elections when party candidate Jeewan Sharma defeated the Congress candidate. This ushered in a chain of victories for the BJP in the next four parliamentary elections in 1996, 1998, 1999 and 2004 when Congress candidate Harish Rawat lost the first three elections while his wife Renuka Rawat lost the election in 2004 to the BJP candidate,” said Deep Joshi. According to information received from the Almora election office, the voting percentage has also risen slowly in this seat. The voting percentage, which was 27 in the first parliamentary elections, never crossed the 50 per cent mark. “The lowest voting percentage in this seat was 19 in the second general elections in 1957 while the highest voting percentage of 49.89 was recorded in the general elections in 2004,” he said. DEO CN Kala said the teachers and principals were told the manner in which the exams would be conducted. SDM Mussoorie Ramji Saran Sharma was the chief guest on the occasion. Col (retired) Penpa Tsering inaugurated the event by lighting the ceremonial lamp and offered the holy scarf on the portrait of Dalai Lama. The outgoing students of class XII were felicitated by the members of the regional Tibetan Women’s Association (TWA), the Regional Local Youth Congress (RLTYC), the Local Tibetan community and the Tibetan Homes Foundation. The students presented several cultural items to mark the occasion. Parents of the students were also present to encourage their wards and witness the grand spectacle. Anita Narula, principal of Central School of Tibetans (CST), in her address, advised the outgoing students to peruse good career and contribute to the society by being responsible citizens. She wished the students a prosperous and successful life. The guest of honour Penpa Tsering gave certificates and awards to the outgoing students.